These are the remarks I made on April 23 as the devotional at the Vermont State House. Truly a treat to have the opportunity to speak about LANGUAGE to my peers. The bride helped immensely, esp. with the riff near the end. And they’ll live on in posterity, journalized in the House Journal for April 23, 2013. This is the beginning of a soliloquy by the warrior MacBeth, and it is instructive in the dangers of quoting Shakespeare, or nearly everyone, out of context. MacBeth engages in an on-the-one-hand argument with himself, until he is convinced that yes, indeed, it would be best if he acted on his ambition, do what the witches suggest, and kill the king, his cousin. Take the action, damn the consequences. I’m not sure how long ago you read Macbeth, but the consequences caught up with him. Shakespeare was quite focused on consequences. And he was focused on language. Scholars claim Shakespeare coined over 1700 words, and maybe 800 have survived through the ages. Assasination being one. Trammel being one that did not. Today is also “Talk like Shakespeare day”, believe it or not, and if you think that’s silly, or that you don’t know enough Shakespeare to participate, well, perhaps you don’t know yourself as well as Shakespeare does. Shakespeare invented words we use in this building every day: compromise and negotiate, frugal and generous, impartial and unreal and monumental and critical. He also coined rant, and jaded, tranquil and moonbeam, advertising and gossip, and, yes, believe it or not, skim milk. First, I will break the ice with a little housekeeping, though I may lay it on with a trowel and give you too much of a good thing. What we do here is not a foregone conclusion; there’s a method in our madness – and that is the short and the long of it. In our work here, we know that clothes make the man; we avoid disgraceful conduct, and maintain fair play, yet we can fight fire with fire in a pitched battle and we remember every dog will have his day. Sometimes what my long-haired colleague says is Greek to me, yet there’s a method in his madness; politics makes strange bedfellows. Let me screw my courage to the sticking place and get at the naked truth in one fell swoop: though you may think it too much of a good thing, the game is up. Oh, that way madness lies! It’s high time to admit – we are such stuff as dreams are made on, and we must screw our courage to the sticking place lest our bills be dead as a doornail. Soon it will be time to vanish into thin air – before we all get up in arms, and hear the crack of doom, let me say this: wear your heart on your sleeve, neither a borrower or a lender be, and to thine own self be true. 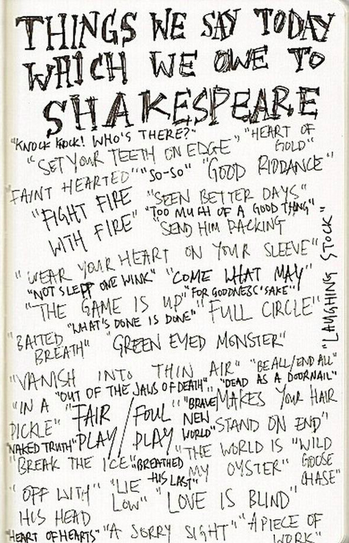 Shakespeare’s language is so ubiquitous in our own, four hundred years on. You may think Shakespeare is difficult to listen to, or to read, or to understand, or even to watch, and you wouldn’t be wrong. But you are also farther ahead than you think. Shakespeare’s genius, these 400 years later, is represented in his ability to wordsmith, to capture in words feelings or emotions that we instantly recognize. His poetry and psychology have defined us more than we know, and what we have at our disposal is his language–beautiful, common and as much a part of our DNA as anything else that has survived four centuries, including the King James Bible, which was published in 1611, at the end of Shakespeare’s career. So, before I hoist myself on my own petard, let me say, one more time, with respect to the end of the session, Let’s keep in context and remember that if it were done when ‘tis done, then twere well it were done quickly.